Messing Around with Graphics.py | Unix etc. At the top of the page is a blancmange like shape. The program that drew it is at the bottom of the article, if you want to jump straight there. Otherwise, a couple of simpler plots will be demonstrated first, just to show a couple of underlying principles. Installing graphics.py can be as simple as downloading the latest version of the file. You can just leave it in the same directory as your python script. Run the program and a window should appear, looking like the image below. When you are ready, click the window to dismiss it and end the program. Edit the above script. Change the “pt = ” line to add a multiplying factor of “2*” to the x coordinate. 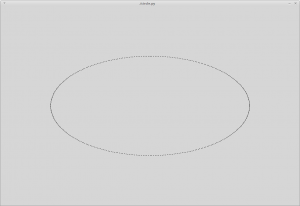 Or, just uncomment the “Ellipse” line and comment out the “Circle” line. If you introduce a multiplying factor to the angle (a) instead, a different effect is seen. Edit the program. Comment out the “Elipse” line and uncomment the “Lissajous” line. This is like the circle again, except that the x angle is multiplied by 2 and the y angle by 3. Run the program and a swoopy pattern appears. It is still a plot of sine against cosine, but the “frequencies”, or wavelengths, of x and y are out by a factor of 1.5. You can vary those numbers to produce more complicated patterns. More accurately, the shape could be called a radial sinusoid, decaying as 1/x from the origin. Although it might seem more complicated than the plots above, this “3D” surface plot is built using similar principles. Plot sine against cosine and you get a circle (a trigonometrical identity). Plot sin or cos alone and you get a wave. Pythagoras can be used to work out radial distances. # Viewing angle doesn't change, so calculate its sine and cosine now (optimization). # and plot both halves at the same time (optimisation). # The start (and end) of the z range for this x.  Pythagoras. # making the pixels line up properly even at high viewing angles. # texture is not uniform. # Distance of this point from the Y axis, horizontally. # y is a sinusoid of r, giving the wavy shape. 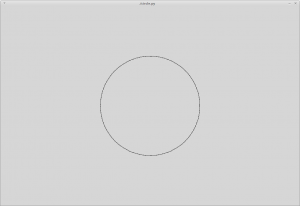 The shape takes about half a second to draw on my i7 laptop, and about 8 seconds on a raspberry pi 2. For comparison, I plotted the same curve using BASIC on an Amstrad CPC464 in the late 1980’s, where it finished in about 5 minutes (and that was with a radius of about 200, not 400). On a Dragon 32 (8 bit, 0.6 Mhz) took about 10 minutes or more. Altering some parameters near the top of the script changes the produced image. For example, try changing the viewing angle, va (currently 10 degrees) to different values between 0 and 90. It represents the angle above the horizontal from which the user sees the image. The effect of radius is fairly obvious. Reducing the wavelength will give you more ripples. Changing the “decay” rate alters the steepness of the shape. Fiddle with the main “y=” statement, and you can draw different shapes altogether. 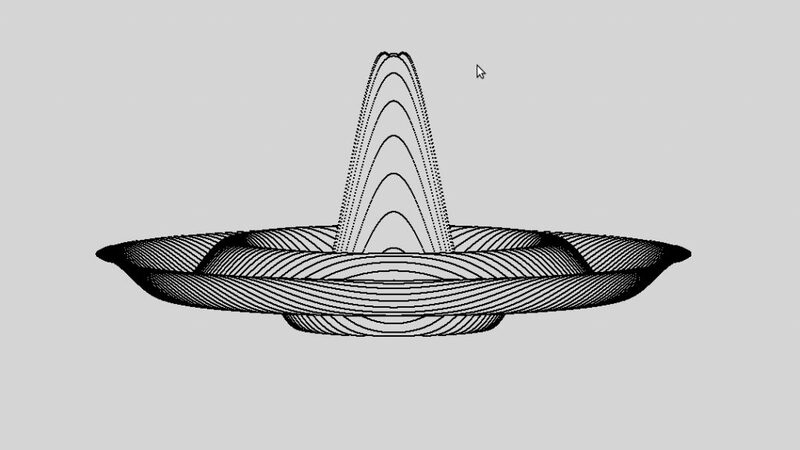 Inserting the blancmange routine into a function and calling it with increasing va (viewing angle), and blanking the screen appropriately, produces a nice animation. It is only practical on a quick machine though, and will be far too slow on a Raspberry Pi. I originally got the “blankmange” algorithm from a 1980s UK computer magazine. But I can’t recall which one it was, let alone the name of the author. Thanks anyway! 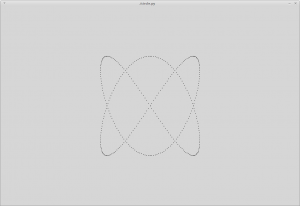 This entry was posted in Coding, Linux, Raspberry Pi and tagged 3D, 3D projection, cosine, graphics, graphics.py, python, sine, sinusoid by Jim. Bookmark the permalink.